The Northern California Chapter, NECA Government Affairs Committee is the Chapter’s political voice. At the local level, we meet with legislators to effect legislation in California. During the election cycle, we review and evaluate local candidates and measures for PAC contributions in our nine Bay Area County jurisdiction. Nationally, the Northern California Chapter participates to effect change concerning legislative actions and regulatory policies resulting in the ability of our electrical contractors to operate their businesses efficiently and profitably. With that in mind, we actively participate in the annual NECA Legislative Conference in Washington, D.C., where a consortium of Chapter staff and members meet with our representatives on Capitol Hill to advocate for key issues, which directly affect our contractor members and the industry. The Government Affairs Committee is comprised of representatives from each of the Chapter’s five divisions to ensure that the voice of all our contractors is heard. Find Your Representative today – http://www.house.gov/representatives/find/. 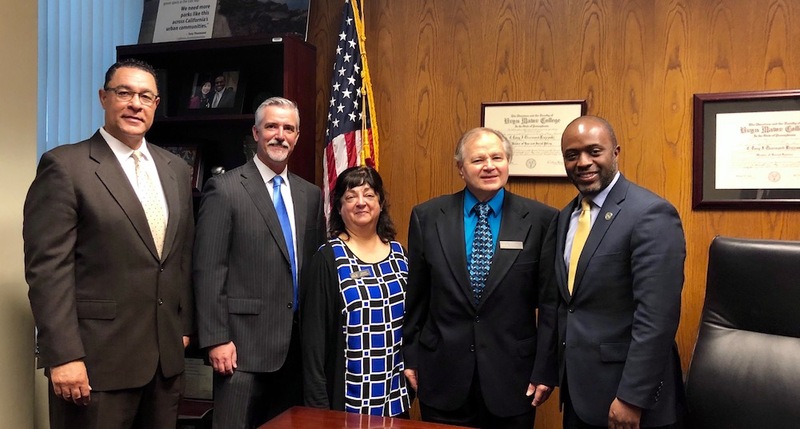 The Northern California Chapter was joined by the San Diego Chapter at our annual legislative trip to Sacramento, held on March 21, 2018. Chapter President Greg Long (Long Electric Company) joined us, along with Board members Beci Anderson (Beci Electric, Inc.), Kurt Brinkman (Intrepid Electronic Systems, Inc.), Lew Frain (Con J. Franke Electric, Inc.), Brian, Dianne and Gene Gini (Collins Electrical Co., Inc.), Rick McKinney (Lloyd F. McKinney Associates, Inc.), and Kim Sabin (Columbia Electric, Inc.). Also joining us from the Chapter were Nadia Brinkman (Intrepid Electronic Systems, Inc.), Andre Gardner (NCECI), Tom Long (Long Electric Company) and Janet McKinney (Lloyd F. McKinney Associates, Inc.). Representing NECA staff were Greg Armstrong, Julie Russell, Ryan Sarna and Scot VanBuskirk, as well as Bob Gutierrez (Business Development Consultant). The San Diego Chapter was represented by NECA staff member Karen Prescott-Loeffler, Bob Davies, Brian Morales, Clint Morgan and Timothy McBride. The day’s event began with comment by our Statewide Lobbyist Eddie Bernacchi. The main topic of discussion for the day was AB 1080, which would allow a 5% bid preference in public works to those contractors who provide credible health coverage to their employees. California’s goal of increasing healthcare coverage and reducing costs is defeated as young construction workers will opt for cash instead of health coverage under the recent repeal of the Affordable Care Act’s “Individual Mandate.” A 5% bid preference in public works for contractors who provide credible healthcare coverage to their workers would allow for fair competition, increase healthcare coverage and reduce costs. Special thanks to all of our contractors who took time out of their busy schedules to attend and share their challenges and successes with their representatives. We would also like to express our appreciation to Eddie Bernacchi for his tireless efforts in Sacramento on behalf of our contractors. Eight attendees from the Northern California Chapter attended our Legislative Conference to meet with congressional lawmakers to discuss NECA’s priority issues such as the Energy Policy, Transportation, Water and the impact of the Affordable Care Act. Chapter President Kurt Brinkman (Intrepid Electronic Systems); Government Affairs Chair Greg Long (Long Electric); Lew Frain (Con J. Franke Electric); Kim Scruggs (Columbia Electric); Gary Woody (Bockmon & Woody Electric) Andre Gardner (NCECI); representing the Chapter were Greg Armstrong and Juanita Mitchell. Over 200 attendees from across the nation heard presentations from members of Congress who enlightened us on the political climate and key issues being discussed on Capitol Hill. Greg Armstrong had the honor of introducing Congressman Jeff Denham to the NECA group prior to his presentation. The highlight of the trip was individual meetings with elected officials from districts within our Chapter’s jurisdiction. This year, meetings were held with Congress members Jim Costa, Jeff Denham, John Garamendi, Mike Honda, Barbara Lee, Jerry McNerney, Eric Swalwell and Mike Thompson, along with a meeting with Senator Barbara Boxer’s staff. Individual meetings were enhanced by our contractors who conveyed personal stories of what they faced as owners of small and medium-size businesses. We found our representatives to be very open to our concerns. Follow-up meetings by our Government Affairs team in Washington, D.C. will be held, as well as local follow-up. © Copyright 2017. National Electrical Contractors Association, Northern California Chapter.